If you value extreme portability over raw power, the Apeman Projector M4 provides a sleek, modern design you can fit in your pocket with surprisingly solid image- and audio quality for its size. One of the biggest perks to owning a projector is being able to quickly display an image in unconventional places, like outdoors. Portable mini-projectors, or pico projectors, offer small, lightweight form factors and rechargeable batteries, granting the freedom to display HD-quality videos and gameplay in any darkened area. It doesn’t get much more mini than the Apeman M4 Projector. While it lacks the power and features of bigger projectors, the Apeman M4 offers an impressive image quality, pleasing design, and painless setup in a tiny package. The Apeman M4 It looks and feels like a modern projector, with a pleasing, black and silver design. The surface area has a highly reflective, glossy black finish. It looks nice but it greedily absorbs fingerprints, hair, and dust. It’s packaged with a protective film cover. The tiny projector measures 3.85 x 3.85 inches and is less than an inch thick, giving it roughly the same surface area of a phone or wallet, while weighing only one pound. When it comes to buttons and ports, the Apeman takes a minimalist approach, with the power and volume buttons on one side and the manual focus adjuster on the other. The battery indicator is represented by four tiny LED lights on the surface. They appear when the device is in use or charging, with each light indicating 25% battery life. The Apeman Projector M4’s minimalist design could be a selling point, though its lack of wireless connections stymies its portability. The rear ports allow for the micro USB charging cable and HDMI video connection (24-inch HDMI cable included). A USB port is provided to charge your phone via the internal battery, while the standard 3.5mm audio jack supports headphones or external speakers. Since the Apeman M4 completely lacks a user interface or wireless connections, the setup process is very user-friendly. Right out of the box it includes a 75% battery charge. Simply plug the included HDMI cable into an appropriate HDMI source, such as a Blu-Ray player, laptop, or game console and instantly see the results. The quick and easy setup is especially appealing for non tech-savvy users who want to jump right in without fiddling with any settings or menus. Connecting your phone or tablet could be a hassle, however. The Apeman M4 only supports HDMI. A mini-HDMI converter is provided in the box, but if you want to connect an Apple iPhone or iPad you’ll need an external adapter to convert to HDMI. A nice perk with the Apeman M4 is a portable, foldable, 360-degree tripod. When folded it measures 4 x 1.25 x 1.5 inches (HWD). The projector is easily screwed onto the top of the tripod, while the ball joint grants superior range of motion for reaching the proper height and angle, and even lets you project onto the ceiling. The tripod isn’t wholly necessary if you place the projector on a flat, medium height surface, such as a table, as the Apeman M4 projects the image at a slightly higher height. As a mini projector that’s light on power, the Apeman M4 benefits from a dark setting and an ideal flat, white surface to project the image. With only 50 ANSI Lumens the area should be as dark as possible for the clearest picture, though even a dimly lit room with the curtains drawn provides decent picture quality, thanks to the DLP image technology and 1000:1 color contrast. In a daylit room, or in daylight outdoors, however, the colors become washed out and difficult to distinguish. Trying to watch a Lord of the Rings film will be a stretch, but you should be able to squeeze most movies out of a single charge. The Apeman M4 has a native resolution of 480p but supports 1080p HD resolution in 16:9 widescreen. It automatically detects the proper screen settings based on the output with no adjustments required. The recommended projection distance from the projector to the image is between 40 to 80 inches producing a screen size of about 30 to 100 inches. We found the perfect setup distance at around 72-inches or 6 feet from the image. This creates a crisp, clear screen size around 64-inches, perfect for home and backyard use. Pulling the projector further away will result in a larger screen, but the quality begins to dip as the picture can become fuzzier and pixelated, even after focus adjustment. For such a tiny projector the Apeman M4 boasts impressive stereo quality sound. Two 1-watt speakers on either side of the projector create stereo sound that fills up a small or medium room. For the best sound quality, remain within 5 to 6 feet of the projector, and keep the volume cranked up. For such a tiny projector the Apeman M4 boasts impressive stereo quality sound. The built-in speakers are never going to match the audio quality of a dedicated external speaker, which can easily be connected with the audio jack. On the plus side, the tiny projector runs almost completely silent when powered on, producing very little noise even when hovering next to it. The Apeman M4 features a rechargeable 3.7V/3400mAh battery. Apeman lists the battery life at around two hours, which is concerning if you want to use the projector to watch movies without plugging it in. The average Marvel Studios film, for example, clocks in at 2 hours and 9 minutes. We tested a Blu-Ray HD movie at nearly full charge, and the battery held out longer than we expected, at around two hours and 20 minutes. Trying to watch a Lord of the Rings film will be a stretch, but you should be able to squeeze most movies out of a single charge. With the rechargeable battery the mini projector also doubles as a portable battery pack. Simply plug your charging cable into the USB slot. When drained the battery takes about two hours to fully charge. Good things can come in small packages, but they’re often expensive. The price tag of $199 for the Apeman M4 is a steep cost for such a small, simple package when compared to many larger and more powerful projectors. Yet compared to similar pocket-sized projectors, such as the Anker Nebula Capsule ($350) the M4 is actually one of the cheaper options. With the Apeman M4 you’re paying for superior portability and ease of use while avoiding any extra fluff. When compared to other pocket-size mini-projectors, the Apeman M4’s $199 price tag is about equal to, or lower than its closest counterparts, though it also comes with the least features. The Elephas S1 Smartphone Projector costs a bit more at $215 for comparable battery life, unit size, and DLP image quality, but also includes a micro SD port and remote control. The PTVDisplay P8I Mini DLP Projector features twice the ANSI Lumens and supports wireless connections, a larger battery, and an Android operating system for $229. 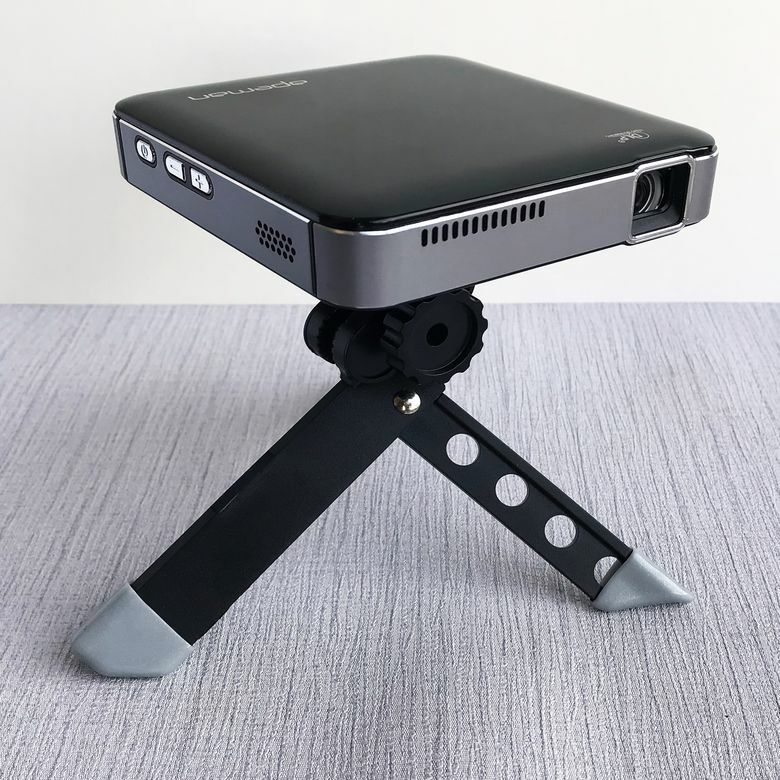 If you’re looking for a mini-projector with a modern design but without the frills of an operating system, the Apeman Projector M4’s minimalist design could be a selling point, though its lack of wireless connections stymies its portability. Product Dimensions 3.86 x 3.86 x 0.85 in.